Unlock the drama and embrace your destiny with these special decks for use with Torg Eternity. 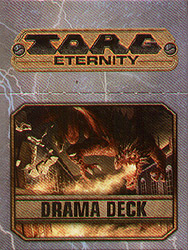 Drama cards control the initiative and pacing of the game, and trigger special events during encounters, chases, or important tasks. Destiny cards allow the heroes to bend reality and perform extraordinary feats! Cosm cards reinforce the World Laws of a realm and provide an opportunity for rewards...and danger!